Kitchen Cabinets and Granite Countertops, Pompano Beach FL > Blog > Blog > Creating A White Kitchen That Works! Creating A White Kitchen That Works! 8 Tips On Creating A White Kitchen That Works! Are you planning a kitchen remodel and dreaming of an all white kitchen, just like the ones you see throughout designer home magazines? You’re not alone; white is the new “it” color for kitchens. Back in the 1920’s, the popularity of white kitchens soared, since then the glamour of an all white kitchen hasn’t faded one bit, in fact its sky-high popularity has recently returned with more vigor than ever before. The National Kitchen and Bath Association revealed 67% of respondents prefer white kitchen cabinets to any other color; this represents a 20% increase over the last 2 years – learn more. 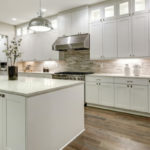 While there is always a trending kitchen color, and you never want to get stuck with last year’s ‘cool’ color, many designers are saying that although white is trendy, it’s still a safe color for kitchen remodels. White is considered one of the most classic colors, guaranteed to stay in style over the long haul. Mick de Giulio is a designer with plenty of awards under his belt, he says, “White has stood the test of time because it’s clean and fresh. And those two words—clean and fresh—are classic words for describing a great kitchen.” We couldn’t agree more! 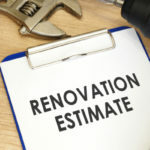 If you are visualizing an all white kitchen, here are 8 Tips to keep in mind while designing the kitchen remodel of your dreams. An all white kitchen might make some think of a plain or unoriginal space, but on the contrary a white space leaves so many decorating options wide open. Add pops of your favorite color using decorative accessories, or wall art. When working around white, anything goes! 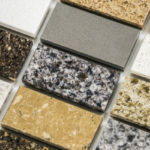 Just because a kitchen is white doesn’t mean you have to keep EVERYTHING white, in fact touches of color will make the sharp white features of your kitchen remodel stand out even more. White kitchens can be both traditional, modern, and many things in between. If you are into the French country look, embellish your white kitchen with fancy wood and curved cabinet details. For a completely different look, create a sleek and modern white kitchen by installing glossy white cabinets that have straight edges and no frills. You can walk into 3 different white kitchens and not one will look or feel the same. Cabinet handles, floor color, and décor elements can add varied looks to a white kitchen, but it’s the original cabinet design that sets the stage for overall style theme. Tell a designer you want a white kitchen and they are going to ask you what shade of white you prefer. White can be beige, an off shade of pink, or a hint of yellow. Even when looking at colors that look almost identical it’s important to think carefully before making a selection, your kitchen’s natural lighting, ceiling height, and wall color are only a few of the many things that will impact the way a color looks in your kitchen. 4. Is There Such Thing As Too Much White? 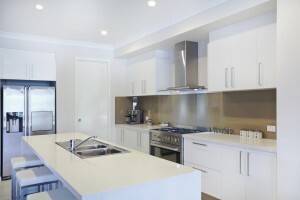 When creating a white kitchen an important question commonly faced is: how much is too much white? For instance, some might feel timid to bring in white upholstered furniture; afraid it will only fade into the walls when placed before rows of white cabinets. Although designers say there’s no need to fear, you can bring in as much white as you’d like. If the white proves too powerful, you can always add a colorful table runner, a bright rug, or an eye-catching painting to brighten up the space. You know how whenever you gain weight you tuck those white pants away and reach for the black ones? This is because wearing white makes us look bigger; the same illusion can be seen in your kitchen as well. If you take 2 equally sized spaces and paint one white and the other dark red, you will instantly see that the white space looks and feels a lot bigger. This doesn’t mean to go clutter up your kitchen, after all the actual dimensions will still exist, but you will enjoy the feeling of a bigger kitchen when the predominant color is white. While a mostly white space can be appealing to the eye, it can also start to feel intimidating—and a little like a science lab. To create a warm and comforting white kitchen you will need to add some contrast. You can add contrast in many ways, perhaps by installing rich wood floors, or granite countertops. Black is never too harsh to mix with white either, black lighting fixtures or bar stools can grant the contrast your kitchen needs to look picture perfect. You don’t have to use bright colors to provide contrast, instead gray countertops, or a layer of light peachy paint can be enough to offset an overdose of white. 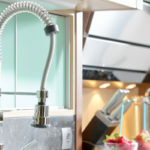 When it comes to any kitchen remodel, it’s the little details that are the most important. With all white kitchen cabinets you want to look over your hardware options carefully, as a certain knob or handle can change the décor of your cooking space. For instance, bold metal knobs might appear more masculine; while crystal knobs can add a very feminine feel to the overall décor. Just because your whole kitchen is white doesn’t mean you have to steer clear of white accessories. If there is space above your cabinets, pretty white dishes can make a nice display. You might be thinking—white, even more white?! But yes, so long as you have some color included elsewhere (on handles, tiling, kitchen chairs, etc.) you can show off white accessories throughout your kitchen. If it looks a bit overwhelming, try mixing different color accessories alongside your white pieces to provide contrast. 10 More Quick Tips for All-White Kitchens!